Nokia Siemens may have its eyes on a big optical networking move in the U.S.
LINTHICUM, Md. (TheStreet) -- Ciena (CIEN - Get Report) shares surged 4% on rumors that Nokia (NOK - Get Report) may be interested in a takeover. The speculation, which was not attributed to any particular source, started circulating among traders around 10:30 a.m. EST Tuesday. The rumors come a month after Nokia Siemens ( SI Networks, the telecom networking joint venture, offered a late $810 million bid for Nortel's ( NT optical equipment business. Ciena had sealed the $769 million deal for Nortel's assets in November during a bankruptcy auction. Some observers wondered at the time whether Nokia Siemens might consider other options -- like a takeover of Ciena -- once the deal closed. "With one move they would overnight become one of the major optical players in the U.S.," says Telecom Pragmatics analyst Mark Lutkowitz. Citing the fierce independence of Ciena management, Lutkowitz does not see a great likelihood of a deal happening between Ciena and Nokia. Ciena shares are down 30% since September when it announced it was bidding on the Nortel assets. Analysts and investors fear Ciena's attempt to double its size with the acquisition may make for a difficult integration period. 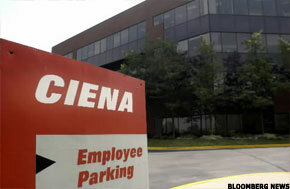 Ciena shares were up 6% to $11.70 in late morning trading Tuesday.